In the system it is possible to perform selective machining of the model surface areas, depending on the angle between the normal to the surface and the vertical axis Z. The range being machined can be defined by the minimum and maximum slope angles, as is shown in the picture (below). The maximum values of the normal slope angle can be assigned from 0 degrees (horizontal area, normal is vertical) to 90 degrees (vertical area, normal is horizontal). It is understood that the plane machining method is optimal when milling surfaces that are closer to the horizontal, and the waterline machining gives best results when machining surfaces that are closer to the vertical. Use of the maximum slope angle of the normal allows the user to machine the horizontal surface areas by plane method and the vertical – by waterline. An example of toolpath machining, obtained by joint use of the plane and waterline-finishing operations is shown on the picture. The plane operation machines surface areas that have a slope within the range of 0 to 45 degrees, and the waterline with slope within the range of 45 to 90 degrees. These parameters are set as default in the complex finishing operation. 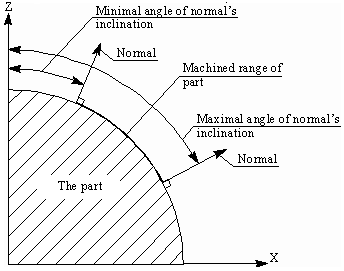 The maximum slope angle of the normal can also be used for milling horizontal areas using a cylindrical tool or for machining surface areas with a slope angle equal to the side angle of the tool e.g. conical mill. The maximum angle of the normal for the finishing operations can be assigned on the <Strategy> page.